I’ve always been fascinated by kaleidoscopes. Turn the tube one way and brightly colored glass particles create a gorgeous, perfectly symmetrical array of brilliance. Many, many moments with my son are like that —dazzling; the colors almost hurt my eyes they are so intense and the pattern so beautiful. Occasionally, if we’re lucky, we actually have entire days of lustrous sparkle and dazzling displays. Saturday was a shining example of such brilliance within my son. We took Nik to the local Fall Festival at the same orchard that hosts the Peach Festival every August; there was nary a meltdown in sight as we drove to “the farm.” With a few exceptions, Nik was like all the other children there —clambering over bales of hay to reach the top of the slides, running through the corn maze, laughing and enjoying the glorious autumn sunshine. Never mind that he wanted to eat the pumpkins; he kept signing apple as he tried to lick the orange skin. Never mind that he had no interest in the petting zoo except to try to climb the fence. The whole experience was a gigantic leap forward from a year ago when Nik wouldn’t even go near the hay or the slides, and kept losing his still tentative balance while standing in the “sandbox” full of soy beans and corn; he just wanted to climb in and out without actually touching the beans or corn—a major sensory aversion for him. I think we lasted twenty minutes before we threw in the towel. This year, Nik managed to hold his own— even in the face of our forgetting to give him his medication before we left the house. He tolerated a return drive home, not getting out of the car (which usually sends him right over the edge) and was pleasant and sing-songy the entire trip back to “the farm.” Niksdad gave him his medicine and that was that; there were slides to slide and hills to conquer. To say I was proud of my boy would be an understatement. Sometimes the gem-colored bits slip and tumble— tripping and sticking on one another. The slightest change can create a jarring, confusing jumble with no discernable pattern, no rhyme or reason to the splintered shards. Lately, it seems our days are becoming more and more like this imperfect kaleidoscope. The colors are still there —we see glimpses as they tumble around, but the pieces are in constant motion, the formation constantly changing. Just when we think we can detect a pattern the pieces shift again, leaving us no closer to the serene brilliance we’ve come to expect as the norm. I’d like to think it’s simply the time of year or a time of growth for my son which causes such tremendous shifts in his daily patterns; I don’t think I can anymore. His behaviors have become more extreme —both the highs and lows—as I cling to a rapidly eroding sense of any middle ground called peace. Sleep has become an elusive specter which will not settle comfortably upon our house. Instead, it teases with brief snatches of slumber interspersed with longer periods of wakefulness. Here, too, there is no discernable rhyme or reason to the patterns. One night is filled with painful shrieks and injurious wrestling. The next is a cascade of gentle laughter and quiet singing as the moon dances in the sky outside my window. We are left weary, without answers to questions we’re not even certain of any more. The daily behaviors are becoming more difficult to laugh off and dismiss as amusing antics. The long-awaited physical milestones —running, climbing, throwing— have crossed an invisible threshold and become potentially dangerous for their perseveration and lack of control. The funny videos I post of Nik climbing or standing on the back of the sofa are funny —for a few moments. Then, they become evidence of hazardous behavior as Nik is determined to master every physical space in reach; he cares not whether we admonish him to stop. Our home is, bit by bit, becoming a Spartan fortress. Little by little, we have had to strip away nearly everything from our family room —where Nik spends much of his time when at home. The end table and lamp long ago gave way to a wall-mounted swing-arm light. That quickly was replaced by a swag lamp suspended from the loft above. The pictures on the wall and the handmade wedding quilt have recently been removed to keep them safe from Nik’s curious hands and to keep Nik safe from broken glass or having an oak quilt hanger crash down on his head as he attempted to swing from the quilt. Furniture has been removed from the room. Moments of brilliance amid increasingly longer, more frequent moments of jarring disharmony. The boy we weren’t sure would walk now runs everywhere. Even his orthopedist recently remarked at how fast Nik is. His exact words—as Nik took off at top speed down the hallway on Tuesday: “Holy cow, look at his acceleration! Give that kid a football!” I live in abject fear of Nik getting away from me in a parking lot or in the street. 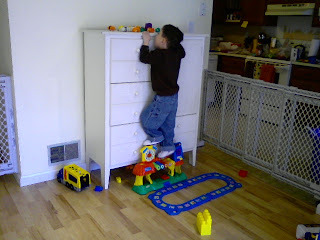 The boy who, for years, wouldn’t raise his arms over his head now has amazing upper body strength; he can pull himself up and over nearly everything. If he can get a good hand hold and something to push his feet against, Nik can climb anything. I can no longer take him shopping unless I have help because he can climb out of the cart faster than I can get him back in. The boy who has been aloof for years now wants to be in physical contact with people all the time. Sitting or holding hands together is not enough. He wants to be climbing my torso, flipping himself backward in a somersault and doing it again…and again and again. He wants to ride on his daddy’s shoulders so he can hang upside down by his ankles as he squeals with delight. Not once or twice but for as long as Niksdad can hold him. The boy who was once oblivious to his surroundings now sees everything. His compulsion to touch everything, to explore and dissect and analyze is all-consuming. On one hand, these are all very good things — until he begins, literally, climbing over his neurologist to get his stethoscope or the reflex hammer. The doctor, a really wonderful sport who adores Nik (thank God! ), puts Nik down only to fend him off moments later —repeatedly. I do not sit idly observing; I am in the thick of it trying to keep Nik occupied sitting on the floor. It is a fruitless endeavor; I finally end up having to hold him in my arms —like a sack of writhing potatoes over my chronically aching shoulders. I am drenched in sweat by the time our visit is over. Sadly, this is not a one-time occurrence. We once thought it was wonderful the way Nik explored his world so physically; it was a necessary part of familiarizing himself with the world he was unable to experience for so long. Now, it has become a danger as well as a distraction; Nik is unable to sit still long enough to complete a simple puzzle or to play a short game of matching images. He is no longer available for more than the briefest moments of learning. Nik is a rapidly growing, strong —and incredibly smart— whirling dervish; we need to be able to harness that energy so our brilliant boy can learn. We’re on the verge of adding yet another diagnosis to my child’s already hefty dossier — ADHD. We’ve fought it for a long time, trying to help him with diet and activity. However, the current situation is simply untenable— for all of us. Reluctantly, we have begun exploring medications which might help Nik with some of his restlessness and impulse control. But there are challenges of side effects which, while never desirable, could actually be dangerous to Nik’s health. We’re limited to certain medications because Nik still won’t chew and swallow more than soft foods or crackers and dry cereal; he certainly cannot swallow pills yet. The remaining options can put him at significant risk for heart troubles because of his cardiac history; we have to get a full cardiac work-up before we can even consider certain meds. Then there’s the whole loss of appetite side effect which can be significant with some of the meds available to us. That’s a huge concern to us given Nik’s feeding issues and history of failure-to-thrive. Though he’s growing well now, Nik is still not even on the growth chart for weight in his age range. My sinewy boy is still able to wear size 3T pants— despite the approach of his sixth birthday a mere seven weeks from now. The final issue is Nik’s hypersensitivity to any medications which alter his central nervous system. Seriously, the slightest changes can send him right over the edge; the highs get higher and the lows get lower —and the swings are faster than usual. It’s not a safe situation. Still, we’re largely out of other options right now. Even the neurontin —which significantly helps with Nik’s mystery pains —does nothing for Nik’s sleep. Nor does the melatonin help. Nik wakes every night now —multiple times most nights, at predictable intervals— and stays awake for a while playing or singing in his crib. During the day, the combination of extreme hyperactivity and utter lack of impulse control makes it nearly impossible for me to leave Nik alone for more than very short periods of time any more. The added layer of significantly disturbed sleep compounds our respective inabilities to cope with the stress. It feels like a deal with the devil; we’re damned if we do, we’re damned if we don’t. Yet, the cost of doing nothing is too great any more. The kaleidoscope turns and the fragments tumble again. What will we see as the shards settle into place— chaos and disarray or brilliance and beauty? One masks the other at any given moment. The shoes should have been our first clue. Nik is always eager to perform this routine; he loves to go out with us. Lately, he’s begun to put his orthotics on by himself —even getting them on the correct feet. He was just beginning to clamber onto the sofa, where I sat waiting with wipes and pull-up in hand, when Niksdad brought over his socks, MAFO’s and shoes. The scream which issued forth from my heretofor sunny child was unlike anything I’ve heard except when he is in extreme and urgent pain. It was the kind of sound which makes my heart race and causes me to drop everything and come running in an instant, certain I will find my child covered in blood. There was much wailing and gnashing of teeth (to put it quite mildly) until we figured out the problem: the shoes. Perfectly good, serviceable Nike’s which Nik has worn on many occasions though not for sometime. (His other Nike’s were so filthy from repeated outings to the park— the laces were nearly black— that I insistedwe wash them last night; they were still in the laundry closet, slightly damp.) I put the offending shoes on the floor at my feet while Niksdad went to get the still-damp shoes. Apparently, even that was too close for those awful shoes; Nik screamed and jumped off the sofa, grabbed the shoes and ran to the entertainment center to put them on top. That’s were they’ve been sitting for weeks now; it made perfect sense to Nik’s sense of order. Once Nik realized the “correct” shoes were going on his feet he calmed down. In fact, he seemed quite eager for our outing. Off we went on our merry way. “We’re going to get ice cream first, then go to the park. Ok buddy? Ice cream first, then park.” I repeated that phrase, like a mantra, as we drove. Nik is usually pretty good about changed routines or routes as long as I tell him the sequence several times over. I should have known that the shoe incident had my precious boy already wound too tightly. As soon as I turned right at a traffic light where we normally turn left, Nik’s tenuous balance shifted and the tempest began. I talked to him in soothing tones as I drove. “It’s ok, sweetie, we’re going to get ice cream first then go to the park, remember? It’s ok. You’re ok.” All the while, Niksdad held on to Nik’s feet so he couldn’t injur himself (or us) with his kicking. I drove with one hand on the steering wheel and one hand holding Nik’s sweaty fingers, gently squeezing to give him some proprioceptive input which I hoped would calm him. We parked right next to the entrance (God bless our disabled parking placard!) and waited for the storm to abate. When Nik didn’t seem to show signs of calming, Niksdad said tersely, “This isn’t going to work, let’s just skip it.” His frustration level was, understandably, rising with each howl and each kick which landed on the back of his seat. Not realizing that Nik was already overwrought and wound too tightly, I insisted we at least get out of the car and try. There have been times when simply getting out of the car has shifted Nik’s attention enough that he is able to calm down and we end up having a decent outing. I also felt very strongly that we needed —I needed— to not be held hostage to the autism. We spent the first two years of Nik’s life sequestered away from everyone and everything because we had to protect Nik’s fragile immune system. We’ve spent much of the last couple years isolated from nearly everyone and everything except the occasional family outing. At some point, I felt, we just have to say “Damn the consequences!” and try —just try— to be a part of the very society in which we want our boy to thrive. Today was not the day for that. We never made it to the ice cream or the petting zoo. We pulled into the parking lot at the park and Nik fell apart again. By this time, he was so overwrought he couldn’t tell us anything. “Are you hungry?” Nik signed please so we offered him a bite of his sandwich; he thrust it at me and screamed. “Do you want to go play in the park, sweetie?” He simultaneously signed please and shook his head no. I started to hum Mary Poppins songs to calm him. It seemed to work until I stopped. The wailing began again. 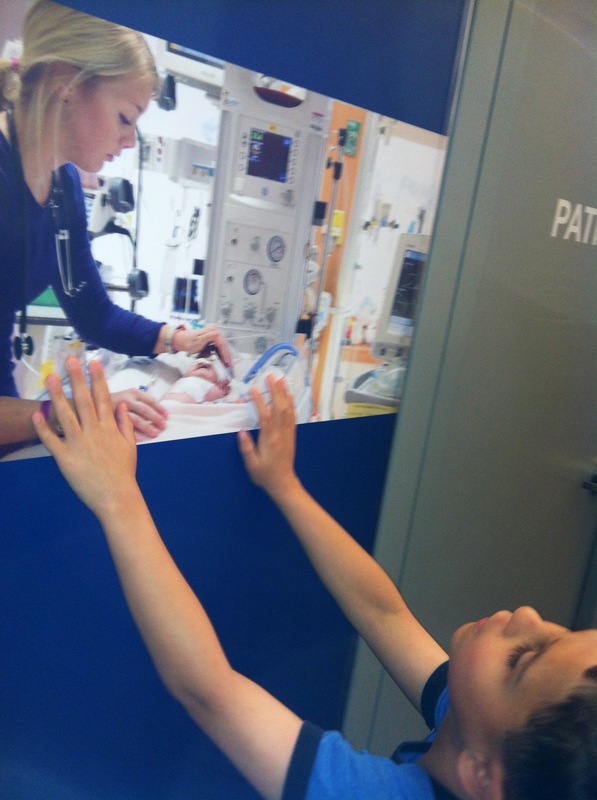 We drove home to nurse our wounded hearts and try to figure out what our boy was telling us, what he needed. As we pulled into the driveway —like magic— the tears and tantrums abated and the happy singing began. Nik has now had lunch and is a very happy camper —singing Mary Poppins and Signing Time songs to his toys, playing with his alphabet puzzles. We may attempt the outing again in a while —or not. It’s so hard, trying to find the right balance between stretching Nik’s boundaries and honoring his needs. Between giving my child what he needs and giving myself what I need. Trusting my instincts and listening to the voice in my heart that says “We have to try…” The lines are hazy and constantly shifting —like walking on a sand dune in a headwind. I believe we are at a crucial point in Nik’s communication development: the more he knows he can make himself understood —and the fewer tantrums as a result of that success, the more intensely frustrated he becomes in those instances where he cannot make himself understood. The extremes seem to be farther apart and I feel stretched to my limits straddling the chasm. But I’ll write more about that another time —after I mull it over some more. We saw Nik’s beloved Doctor Mary this afternoon. It’s true, she is beloved; she is the only doctor Nik will ever fully —and joyfully— cooperate with no matter how awful he may be feeling. He adores her and makes her laugh; it’s a win-win social skills situation all the way around. The abdominal x-ray —which I must say Nik was an absolute champ for— showed no structural concerns but did show a significant amount of stool in the large bowel. At first blush, it appears that he is developing a bad case of constipation —bordering on a partial obstruction. I won’t go into graphic detail about what leads Doctor Mary to this conclusion. Imagine your kitchen drain being partially clogged; it still works, just a little slower. When it gets really bad, you have to, erm, help it along. Same thing with Nik. Of course, this doesn’t address the underlying cause of the situation; one thing at a time. So, if I disappear over the next couple of days, though I hope not to, you’ll know it’s simply because things have gotten —as the good doctor put it— “worse before getting better.” If that doesn’t do the trick, we’ll revisit the issue with Doctor Mary at the end of the week. She may want another x-ray to see just how bad things look. Fingers crossed that it all, ahem, comes out okay.